Vintage 2013 provided ideal conditions in the vineyard, and our inaugural Zinfandel expresses the elegance of the fruit from this vintage. Pepper-laced black raspberry aromas are swirled with rich oak notes. A silky smooth entry showcases deliciously ripe blackberry and dark cherry flavors woven with creamy cocoa. White and black pepper spice up the texture and lend balance to the luscious fruit. 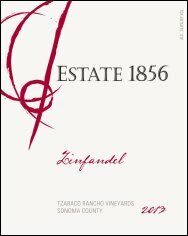 The fruit-driven core and integrated oak and tannins create a sophisticated Zin with finesse and grace. Food Pairing Suggestion: This dark-toned Zin will pair well with Steak au Poivre with a Brandy cream sauce, or Tuscan lamb chops with warm white bean Provençal.